The Harvest Pool is AWB’s post-harvest pool designed to commence marketing from the time farmers begin delivering into the program. 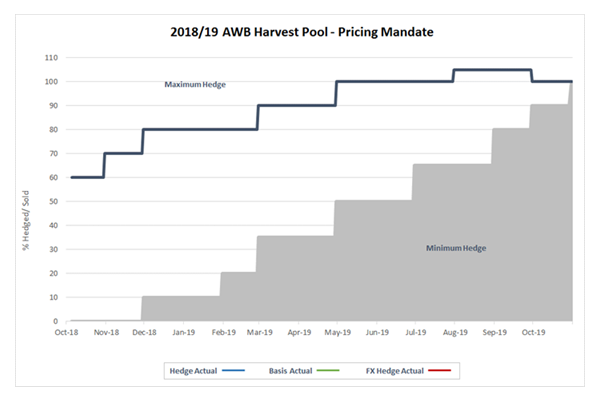 The pricing mandate in place for the Harvest Pool is designed to ensure that the pool can participate in market opportunities from harvest and through until October prior to the following harvest. The Harvest Pool objective is to provide market participation across the marketing window and works to protect and improve pool returns through active management of physical, futures and currency components. PROGRAM SUMMARY: Harvest Pool is an actively managed 12 month program designed for growers who want to begin to market their grain beyond harvest and who would like a program that is finalised prior to the following harvest. PROGRAM OBJECTIVE: To provide market participation across the marketing window and works to protect and improve pool returns through active management of physical, futures and currency components. The maximum percentage sold being below 100% until August 2019 ensures that program participants will be exposed to market movements until this time. The minimum percentage slowly increases over the 12 months ensuring that the manager is always actively participating in market opportunities. Physical sales strategies will be managed to achieve a minimum distribution of 25% to 30% equity less costs at each distribution. The AWB manager will use their discretion, within the pricing framework, to determine the appropriate strategies based on current and anticipated market. DISCLAIMER: There may be tax consequences for you in connection with the Products. This may include tax being payable on any scheduled payments made to you. The tax treatment and the year in which payments may be included in your income may vary depending on your specific circumstances. The information presented in relation to the Products does not constitute tax advice to you. It is very important that you seek professional financial and tax advice in relation to your particular circumstances.